I read a good ebook this week on my Kindle. 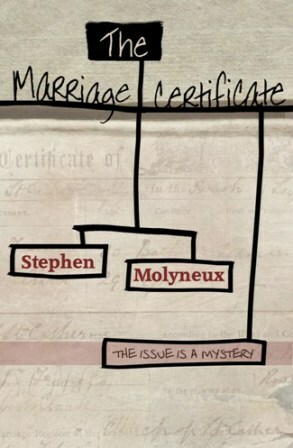 Not sure how I found it, but it’s call The Marriage Certificate by Stephen Molyneaux. If you’re a genealogist like myself as well as a writer, it’s got it all. The basics of the story is that the man buys a vintage marriage certificate from an antique shop and decides to figure out who these people were and see if he can find any living descendants of the couple to give the certificate to. The other story in the book takes place back in time and is the real story of that couple. It’s a great book, but …. When I got to the end of the story, there are no links to his other books or an Amazon author page for me to find out more about the man who wrote such an interesting story. I have to say, I was really disappointed. I searched Amazon and found he had no other books listed so I’m out of luck there. Then I decided to google him. When I did, I found he had a website after all! I have to say, the website has some interesting background on how he came up with the idea for the book. If I were him, I’d have written that as A Note From The Author at the back of the book and embed a link to his website as well. Even if he isn’t looking to cross promote other novels he’s written, he could have enhanced his readers experience with that added info at the end of the book and the link would have added photos of the places visited in the book. Like I said, I really enjoyed this novel. The characters are very engaging, so much so that when they start to die out of no where, I was totally shocked! Anyway, I’m posting about it because it was a great example of a wonderful book that is totally lacking in the promotion department. It’s such an easy thing to do to embed links at the end of your novel. Write up your author Bio and put it in the back. Readers want to know about the person who wrote the book they just read. If it was inspired by actual events as this book was, THEY REALLY WANT TO KNOW THAT! Yes, he has a website, but I had to go off Amazon and my Kindle to google it. I’m afraid that’s not quite good enough these days.